The colour palate is muted – the background of the house in shades of warm beige, blues, greys, with vibrant orange for detail – a modern landscape dotted with homely paraphernalia: the younger sister’s tea party, Halloween outfit, skipping rope, scooter, set against the older sister’s secret diary, computer, phone, and guitar. But it’s the positioning of the sisters that pulls at the heartstrings – the younger child’s peeking through a doorway, or locked out completely (reminiscent of ‘Do you want to Build a Snowman?’ from Frozen), as opposed to the older sister with her feet up on a desk, lounging reading a magazine, sprawled across a sofa, painted nails, chats with friends. Simona Ciraolo has captured both a small child’s stance and a teenager’s with flair. The illustrations are in soft crayon, and beautifully accomplished. The book resolves itself with joy – as the older notices the younger’s tears and invites her to join in with dress up and music, with beautiful phrasing on the last page, which I won’t reveal. For a younger sister there is solace in this new relationship – for a mother reading it – it’s heart-breaking. A very clever picture book. To purchase, click here. 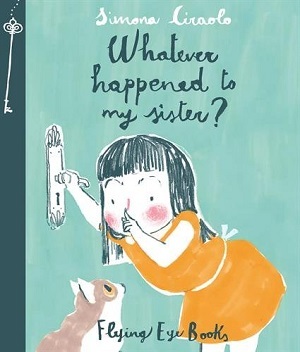 This is another book that tugs on the heartstrings about sisters, but aimed at a teen audience, and about a completely different type of sisterly relationship. Sixteen year olds Tippi and Grace are conjoined twins, their bodies are meshed together at their hip, although they have separate hearts, heads and each has two arms. The book tells of what happens the year they start attending main school rather than being home educated (for financial reasons), and also explores the impact as their health begins to deteriorate. 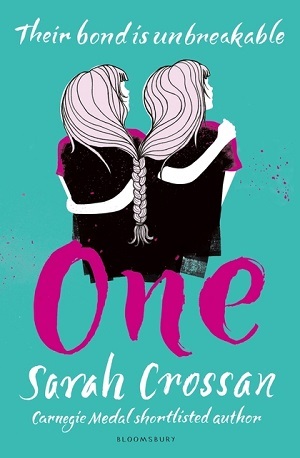 Sarah Crossan’s extensive research about their situation and emotions shines through the story, but what separates this book from other teen novels about serious health issues is the author’s use of free verse to tell the story. By being so sparing with words, and by utilising not only words themselves but their positioning and spacing on the page, Sarah creates a pacey plot alongside deep and moving emotion. No word is superfluous. She integrates the rare situation the girls are in with the normalcy of teen love, friendships, sibling relationships and school. The language is so spectacularly beautiful and well-crafted that the reader melts even before the heart-breaking ending. Sarah uses the same pared down power to eke out superb character portraits with just a few simple phrases. The reader’s breath is taken away before they even reach the final denouement. Highly recommended as a heart-rending read, but also to show what can be done with poetry. To purchase click here or see the Amazon sidebar. Both these books make it into my top ten reads so far this year. Please note that Whatever Happened to My Sister? was kindly sent for review purposes from Flying Eye Publishers.